Being low on energy happens to all of us, especially moms. We tend to believe that constant exhaustion is our new reality after the arrival of children, coupled with stressful jobs, and fleeting attempts at being a responsible adult. The truth is, being tired now and then is normal, but if you’re waking up tired regularly and struggling with the afternoon slump even after a few coffees, it’s time to look more closely at what’s really going on in your body. You’re doing your best, drinking smoothies, eating salads, and getting to the gym now and then so what gives? Unfortunately, even with our best efforts we can still get caught with nutrient deficiencies. Missing this one nutrient, a four letter word, can manifest itself as chronic fatigue, unexplained hair loss, or headaches. That nutrient is iron! If this is you, know that you are not alone, and in fact, iron deficiency affects several hundred million people worldwide, according to The World Health Organization and women, between the ages of 15- 45 are the most susceptible. Although women need twice as much iron as men due to its loss during menstruation, the average consumption is only about one-third of the recommended daily value for women. Now perhaps that feeling of outright exhaustion and mental fog makes more sense now? If you want to be sure, speak to your doctor or Naturopath and get your levels tested. So you're iron is low —now what? Now before you run out to the health food store to pick up the fanciest supplement bottle there are some great ways to increase your iron levels without extra pills. Iron rich roods are absorbed better in the body when consumed with vitamin C rich foods. Think about a fresh bean salad topped with a lemon vinaigrette dressing, or some sauteed swiss chard next to some wild caught salmon. Turmeric taken everyday throughout the month can work to reduce menstrual bleeding. Take it with a fat, such as coconut oil and black pepper for better bio-availability. By decreasing the volume of blood loss during menstruation you will naturally save on your iron stores. There is a substance found in tea and coffee called tannins that can inhibit iron absorption. I know it’s a stretch, but if possible save your warm drink for at least an hour after your iron rich meal. Calcium may also interfere with iron absorption. Try taking them on an empty stomach or with some fresh lemon juice to improve absorption. Folic acid (B-9) and (B-12) can both help to reverse or prevent an iron-deficiency. The richest sources of both the mineral and the vitamin are animal products, like red meat and fish. Plant foods, like nuts, beans, seeds and lentils also contain iron. Plant foods don’t naturally contain B12, but fortified foods such as breakfast cereals can be found and contain both synthetic iron and vitamin B12. Who would have thought that our Grandmother’s best cookie staple ingredient could be such a great source of iron? Why not gain the benefits of additional iron while swapping out refined sugar? 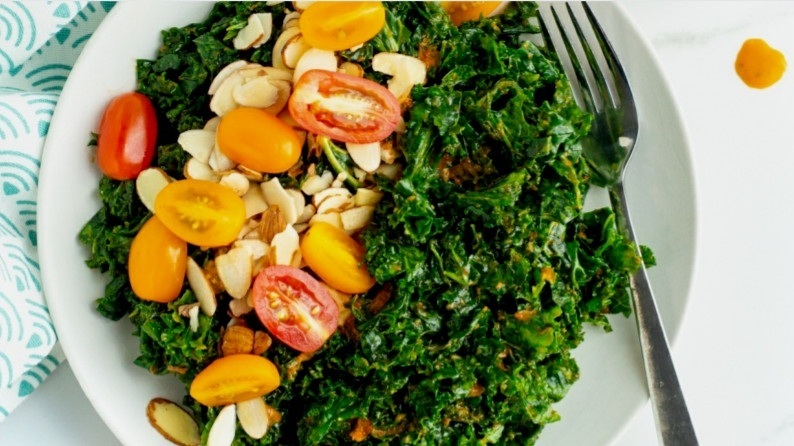 Try adding this dressing recipe to your favorite kale salad. I truly believe that food is medicine, but we must remember it takes time, patience, and consistency. The beauty is in our ability to heal from the inside out and to heal at the source rather than treat the symptom. Are you curious about how to implement healthier choices into your life? Would you like help being as healthy as you can? Let’s talk! Schedule an initial complimentary consultation with me today—or pass this offer on to someone you care about!